Disclaimer: This post has been written in 2014, when the country just stared to open up. Since then, things have changed A LOT. Friends that visited last year told me stories of cheap sim cards and 3G everywhere; online accommodation booking and no more Chinese trucks from the ‘40s. Anyway, the struggle is still real. The message here is that while Myanmar is a wonderful and still partly unspoiled Country, it ain’t no entry level Asian destination. I often discuss this matter with other well-seasoned backpackers that have been there too and everyone admits it’s a tough Country to travel in. I don’t mean to discourage you if you’re planning to go, but be aware that it won’t be a walk in the park, at all. Be prepared. So here are my tips for travelling to Burma. That is how Rudyard Kipling introduced Burma in his Letters From The East in 1898. More than a hundred years later, when you step in Myanmar, the feeling still stands. With a contemporary history marked by the longest military dictatorship in the world, the opening of its borders is quite a novelty. Virtually cut off from Western progress and influence, Burma is still a place where people travel on carts towed by oxen, on plows, on Chinese trucks 50 years old with bare engines and, more generally, on Thai vehicles (left-hand drive) driving the English way (driving on the left). Both the direction of travel and the name of the country changed in 1948. Burma became Myanmar when the newly born military junta wanted to take a sharp turn after the English era. Outside the big centres, women still make laundry at the river. They carry water at home two ounces at a time, and electricity is almost never working. Even in Yangon and Mandalay, blackouts are still quite common, that’s why you’ll see gigantic diesel generators outside of most buildings. Although internet and mobile phones are spreading fast, costs are still a bit crazy: one hundred dollars for a sim card and a Wi-Fi connection speed that takes you back to the nineties. On street corners, you’ll find ladies sitting at small desks with a landline phone on top. They are the freelance of the phone booth: people go see them to make phone calls with spare change. 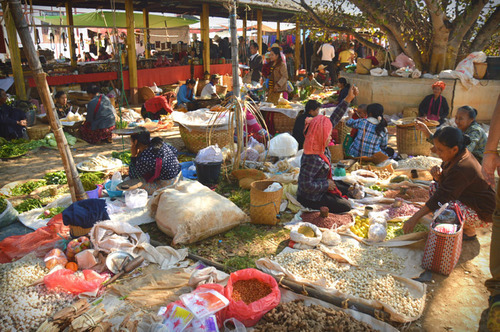 Myanmar is also a country inhabited by a huge variety of ethnic minorities. Tribal groups speak their own language, have different traditions and different religion. For decades they have fought for territorial independence, meeting the hard knock of the regime, bloodshed and persecution. Despite the alleged current peace, disorders continue in various areas, obviously off limits for tourists. Indeed, entire parts of the country are still closed, others have just opened and can only be reached with endless combinations of buses, boats and jeeps, or even exclusively by air. In any case, no one seems to be able to provide reliable information about where you can go and where you can’t. However, things are changing fast in Myanmar. 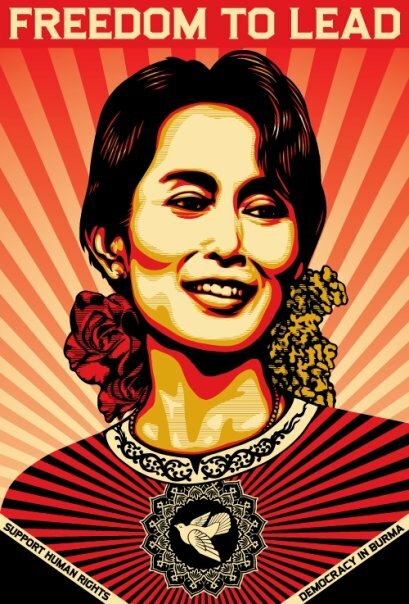 In recent years, the regime has finally released the political prisoner and democratic ambassador Aung San Suu Kyi, it organized a pseudo-election and finally welcomed some opposition members in parliament. Some hundreds of political prisoners have been released, although as many remain in prison. Newspapers and magazines still have to pass through government censorship, making it impossible to publish anything more frequent than a weekly paper, but you can now see pictures and articles of the Lady in the local press. In many restaurants, you’ll find her portrait on the walls and people start to be less afraid. Since last August (2013), three land crossings with Thailand have been opened, and the tourist visa has been extended to twenty-eight days. All these changes have created a few discrepancies with the travel stories we collected before coming to Burma. Those who had been here only three or four years ago complained the lack of time and advised all the experiences they couldn’t do: day trekking through the countryside around Inle Lake, almost unattainable archaeological sites, slow boat cruises that lasted two/three days and so on. On the other hand, those who just came back argued that surviving the long month of the visa wasn’t easy. The truth is that traveling to Burma is tiring and exhausting. 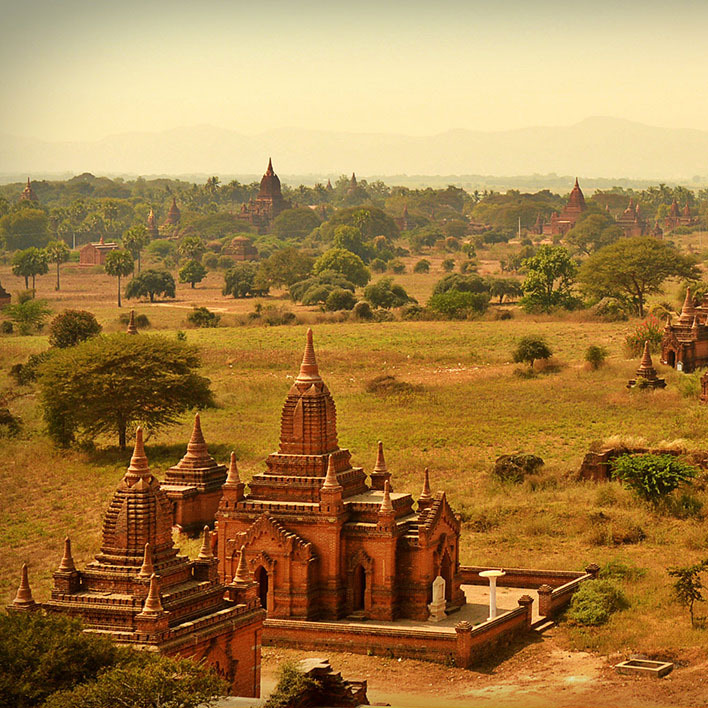 There are just four main destinations where tourists are pushed: Bagan Pagodas, the placid Inle Lake, Yangoon and Mandalay. Despite this, huge gaps in the newly born tourist industry make travelling extremely complex and tiring. Crossing the border from Mae Sot to Myawaddy by land means moving along with thousands of Burmese and Thais on their way to the Friendship Bridge carrying massive luggage. We crossed the border mountain range on a six-seater car, with seven people aboard, on a dirt road where the traffic is one-way every other day. A desperate trip made in an infinite convoy of vehicles of all sorts and age, usually with a load twice their size. 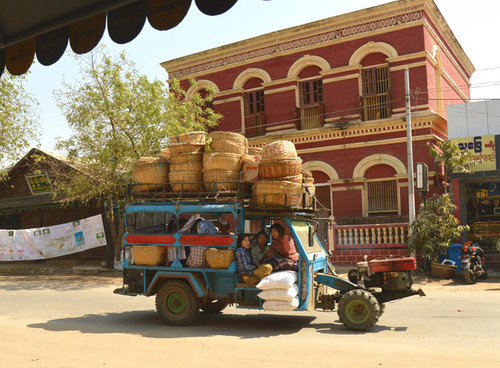 A compact mess that moves at 20km/h and stops each time a truck takes a break to cool down its tires and engine (locals has set up roadside business of water cane cooling, as in the best Asian entrepreneurship tradition). The red grins of men, with their mouth full of betel. That’s a chewing mixture of nicotine-like herbs and red roots that makes everyone look like Dracula. The women’s shy smiles, with their tulle hats and their tanaka-painted face, the traditional make-up made of powdered bark and aloe, which keeps their skin fresh. The children who say hello non-stop: “hello, bye bye, ningalabaaaaaah!” Music that is everywhere and anywhere all the time. Everyone is singing, listening to a blasting radio or pumping traditional songs in home-made sound systems for the benefit of the whole village. The cult of tea and tea houses, open as early as 3am to welcome at their comforting bonfire the spare travellers that just descended a bus and have no idea where to go. 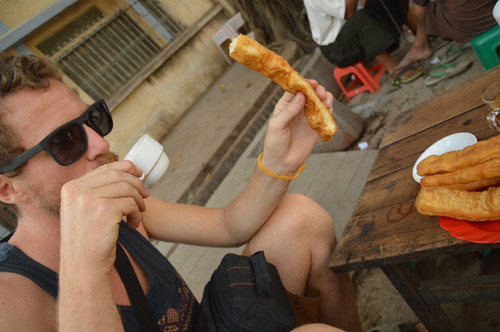 Burmese tea is often mixed with condensed milk and served with hot fritters: so sweet that your coronaries might explode just looking at it. Near the southern border with Thailand you’ll find Hpa-an’s rice fields and granite pinnacles, Bhuddas-filled caverns and sleepy villages. Very few tourists make it till here so the place still holds plenty of atmosphere. 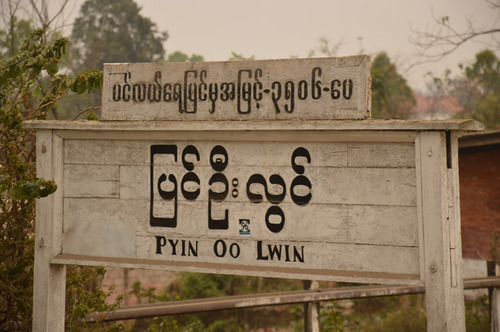 The railway line between Mandalay and Lashio sways for 240km through the countryside. From the window youl’ll spot farmers with the typical pointed hat and children walking to school wearing the traditional lonji (the local sarong). Misty mountains are crossed by the massive Goteik viaduct, where the train slows down at a crawl. Absolutely not to miss are the tribal villages of the Golden Triangle, on the border with Laos and northern Thailand. Here time seems to have stopped a hundred years ago. Akha women still wear elaborate hats decorated with silver coins, while Ann women wear garments as black as their smile, darkened by the spices they mix with betel. 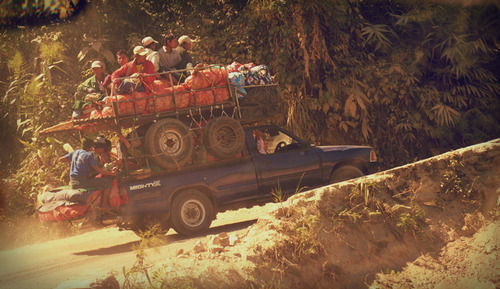 Myanmar ain’t no backpacker paradise. Actually, most of the time you can count tourists on one hand. This plus the scarcity of areas where you can actually go means that you’ll easily meet the same people everywhere. When I spent a day alone at Inle Lake (Andrea was back to Bagan to see the temples he hadn’t seen due to fever) I met more people then than during the previous month. I had a bike ride, I crossed the lake with other people loading five bikes on a longtail boat, I swam, climbed up to a mountain monastery, and attended an unlikely wine tasting on the hills at sunset. I even had an Italian dinner prepared by a local chef who learned the art from a passing italian. Everything was priceless. The wad has to be equally divided in brand new US dollars and in Kyat, the local currency. Which can be tricky if you’re not coming from home but from Thailand, and you have just one credit card left between the two of you (This is another story, but just in case you are in the same situation: raise the card withdrawal limit, find a big bank like Bank of Thailand that allows cash back operations, withdrawl in bahts, change the bahts in dollars and then change half of it into Kyat on the black market of the border: swift and easy). Like when we spent two days and one night on the local boat from Bagan to Mandalay, without any book, playing cards, food (or at least edible food), toilets (apart from a hole in the floor in the back of the boat), nor sleep. 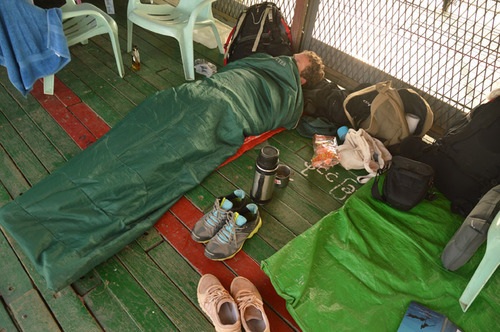 As if deck sleeping wasn’t sweet enough, the village where the boat was docked transmitted three hours of super loud Buddhist prayers in the middle of the night. A gem. 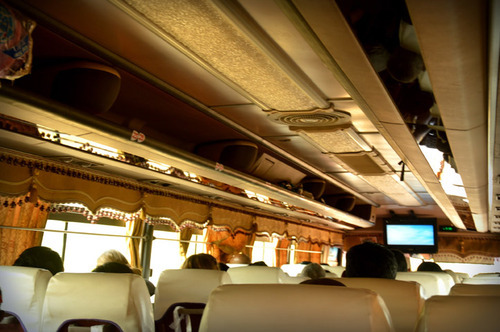 On long distance buses, the ubiquitous TV-set broadcasts loud local soap operas with actors donning longjis and tanaka. Or super lame shows that include songs, dances, traditional costumes and very sad jokes highlighted by laugh track. Or even pop song karaoke videos. With the singers that look like faded photocopies of Western pop stars who struggle with love triangles. For some obscure reason aircon is always adjusted on level “arctic breeze”. Not that the rest of South East Asia is any better on the matter. So, as a general rule, wear your warmest clothes and for god sake put on a beanie. Buy one at the bus station if need to. You’ll thank me later. You’re welcome. In short, Myanmar is a mess. If you choose to go, be ready. And if you’re ready, be more ready! Try to avoid the beaten track (the coasts of the south and the north-western territories just opened) and for the love of God keep away from the boats!